There is a new church on the horizon. It usually operates out of the back ends of cars, often after dark and late into the night. So far it exists in six locations in Maine as well as in six other states. It is called the Church of Safe Injection. Its founder is a 26-year old drug recovery coach named Jesse Harvey. He preaches the Gospel of Harm Reduction: we should use all possible measures to protect drug users from the harm of their drug use. Measures include clean needle exchanges, and, in the case of potential overdose deaths, a life-saving substance called naloxone. Last October Harvey started loading up the trunk of his 2017 Honda with sterile needles, naloxone, rubber tourniquets, alcohol swabs, and other materials to avoid infection. Every week, usually in the evening, he drives to a site in Lewiston where drug users congregate. He makes these supplies available to all who need them. While many states have now authorized needle exchanges, 15 do not, and services that do exist are often sparse. Maine, which spans over 35,385 square miles, offers only six, mostly in the southern part of the state. Only four make naloxone available. 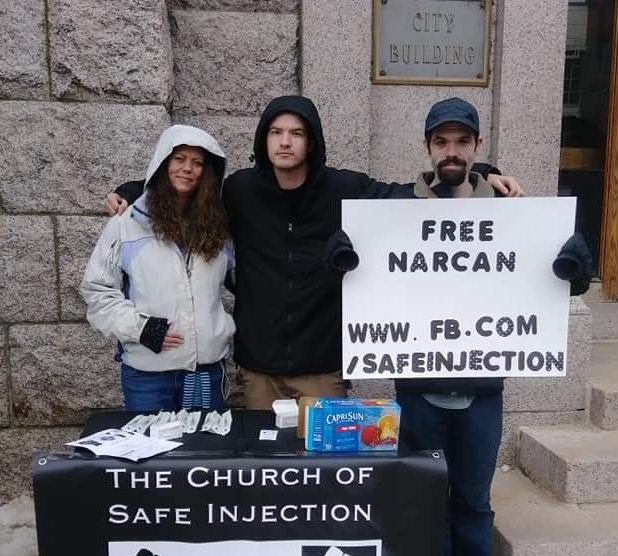 The Church of Safe Injection has only three rules for members: they must welcome people of all faiths, including atheists; serve all marginalized people; and, of course, commit to supporting harm reduction. For the most part, the individuals have gathered outdoors. But there have been some house meetings along readings, including scripture. The location within a physical structure will bring Harvey closer to what has been his goal from the beginning: a safe injection site where individuals can administer their own drugs under supervised care to insure safe and clear conditions. Such sites exist in at least 60 cities spread across Western Europe, Canada, and Australia. They are illegal in the United States, but strong support exists in Boston, New York, Philadelphia, San Francisco, and Seattle. Harvey’s strategy at this point is: first, to incorporate the church as a not-for-profit; and, then, to apply for a religious exemption from federal law. He is looking to a 2006 Supreme Court decision that permitted a small sect to continue import a mind-altering drug – ayahuasca – for use in religious services. At the end of the day, what Jesse Harvey is doing is an act of civil disobedience. He is breaking the law. He distributes more than the limit of 10 needles at a time permitted in Maine. He also has never obtained certification to operate a needle exchange facility. Who among us can disagree?